Dr. Fry found that 25 words make up 1/3 of all words published, 100 words make up ½ of all words published and 300 words make up 65% of all written material. These high frequency words should be recognized instantly by young readers. 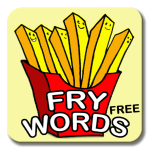 The Fry words are helpful for adults learning English as a second language as well as for children. This app has 500 words divided into five levels and then divided into groups of twenty-five words, based on frequency of use and difficulty in a flash card setting. 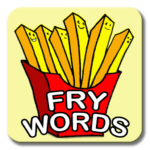 Download Fry Words from the Google play store for FREE! PAID ad-free version of Fry Words is also available. 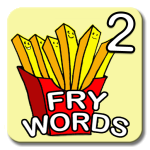 Fry Words 2 contains the second group of 500 words divided into five levels and then divided into groups of twenty-five words, based on frequency of use and difficulty in a flash card setting. Free and Paid versions are available. Fry Words 2 – The second list of 500 words. Download from the Google play store for FREE! 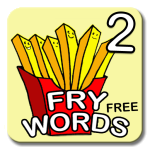 PAID ad-free version of Fry Words 2 is also available.